13' X 11' American Flag with 464 C7 LED Bulbs. 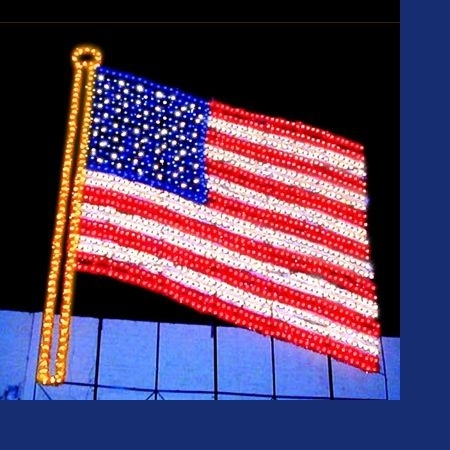 Sold in Steady Burn or Animated - (Colors on flag move left to right) speed control knob is attached to display - also available 10' X 8' American Flag with either steady burn or animated. Made for each customer. Building mount decoration. We can make this a ground mount as well, just call us. Call ahead to place your order. Allow 3 to 5 weeks manufacturing time. Call for shipping rates. Weight of display is 145 lbs.